When guests decide to stay in a hotel they expect to receive high-quality treatment. Usually, when someone stays in a hotel it is because they are on vacation and looking for a break from reality. They want to escape for a brief period of time and enjoy the company of family and friends. While on their vacation, guests expect to receive great service and amenities from the hotel and staff. One thing that can help achieve this is stocking your hotel rooms with high-quality linens for guests to use. The most important of these hotel room linens is the sheets. Sheets are a very important part of the guest’s experience since it is the thing they use most often and are a factor in getting good nights sleep. Ensuring your guests have luxurious high thread count sheets is must in order to provide them with the kind of service they expect. When guests enter their room and decide to lay down they will immediately notice the quality of the sheets and be impressed if they are of a high thread count, feeling super soft and allowing them to sleep comfortably and easily. At Riteway Linens, we provide a wide range of options when it comes to sheets for your hotel. Our sheets come in all different sizes and range in thread counts and cotton blends, to ensure a perfect option for any hotel. Whether you are a small motel or a full-service luxury hotel, we have the sheets to suit your needs. 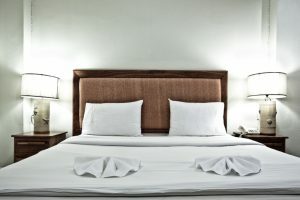 We also have many other types of linen for your business including a wide variety of towels and robes to keep guest feeling comfortable and pampered. Feel free to contact us today at 772-336-0175 to speak to a representative or simply fill out our online form to receive a personalized free quote!